Their story was bigger than even they knew. A hope for the future, a chance for a new beginning and a danger that neither saw coming. Was it love? Lucinda Whitney delivers small town stories with big time suspense wrapped up in heartwarming reads. 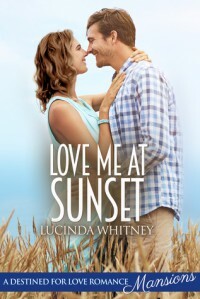 Love Me at Sunset is one man's journey to redemption and one woman's second chance at love. Against the backdrop of beautiful scenery lies a tale of heartache, intrigue and romance that is good at keeping readers guessing and hearts racing until the end of the line.